How to use Mini CAD Viewer - How can I open DWG file without AutoCAD? 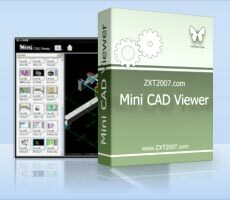 What is Mini CAD Viewer? Mini CAD Viewer is a compact free DWG Viewer and DXF Viewer that is designed to be easy to use, even for those with no prior CAD experience. Mini CAD Viewer allows you to move and zoom in and out, and to draw as needed on current view. It features “thumbnail” view, which allows users quickly perform searches on task folders. Mini CAD Viewer supports DWG and DXF formats, and drawing files may be saved as image files. How to preview a dwg or dxf file. Step 1: Select the folder. Step 2: Double-click the file. How to pan or zoom the view. Click the “Tool” button on the top. Next, click the view and move the mouse as needed. How to print the view.